The global informal economy (that is, legal income out of sight of the government and tax authorities) is substantial and comprises close to a quarter of global economic activity. Capturing the informal economy could bring many benefits, including less poverty, more job security, greater access to social benefits, and additional tax revenue to fund the development of infrastructure, education, and healthcare. Digital payments can significantly reduce the size of the informal economy and are an essential component in the public policies governments can implement. A study by A.T. Kearney, commissioned by Visa, shows that there is a strong inverse relationship between the volume of digital payments and the size of the informal economy. The higher the use of digital payments in a country, generally, the smaller the size of the informal economy. 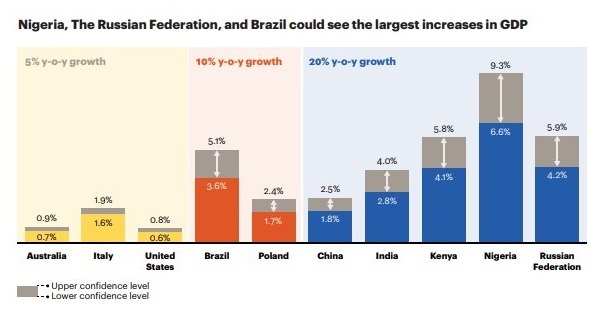 The countries that have been the most successful in reducing the size of the informal economy have one thing in common: they focus on reducing the use of cash and improving the acceptance and adoption of digital payments. Financial inclusion programs have a proven record of growing digital payments and driving increased participation in the formal economy. And, as shown in the chart below, the impacts on a country’s GDP can be profound. The boost to GDP is greatest in the developing world, where the informal economy flourishes. For more details, download the study report.